An excerpt from upcoming interview for CorporateSchill magazine. Interview conducted by O. Bonn. O. Bonn: So why forgive Corporations? CJ: In America, Corporations have recently gained the same legal rights as citizens, but Corporations don't really have the same responsibilities as the ordinary citizen, things like paying taxes and obeying laws don't really apply to them. 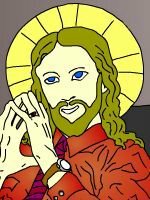 This can lead to feelings of guilt, especially if the Corporation has been acting badly, and there's been a lot of Corporate sinning lately, so much so that my Father decided it was time to allow Corporations to seek and recieve forgiveness and salvation. 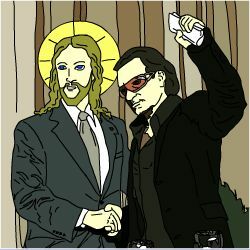 So He decided to create a Savior for the Corporations and here I am. O. Bonn: How does it work? CJ: It's really surprisingly easy, a Corporation only has to have faith and believe in me, and also show some real remorse for their sins. To a Corporation the most valued thing is money, it's really their lifeblood so to speak, so in order to show real remorse, my Father decided that Corporations are going to have to sacrifice some of that lifeblood to really help to pay for their sins. If a Corporation has faith in me and completes the financial transaction, that Corporation will be forgiven. Isn't that marvelous, an end to Corporate guilt. And they can get eternal life too, but that requires faith. I can't really comment too much, but there's a good chance that a certain "Low Price Leader" will be opening up some Mega Stores in some of the neighborhoods up in Heaven. O. Bonn: What about people? CJ: Well there has been a huge outcry up in Heaven to offer forgiveness to Americans. 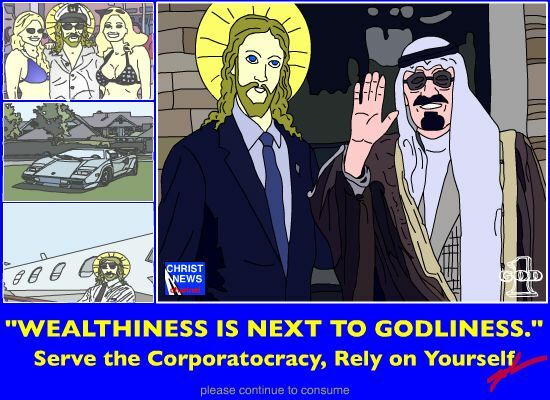 There's something most Americans don't realize, they think that Biblical Jesus is forgiving them their sins, but the thing is they don't even worship the guy! I mean turning the other cheek, loving your enemies, helping the sick and poor, hanging out drinking with prostitutes, that's Biblical Jesus, not torture, war, poverty for most, riches for the few, love of money, love of power, celebrity worship, oh I could go on, but it's all rather boring by now. Let's be honest, Americans love money, just like the Corporations do, so that's why I'm going to be offering forgiveness for individuals based upon the Corporate forgiveness model. I'll be starting with seven not so deadly sins, and we'll see how it goes from there. Although I'll be on a short vacation you can still Get Forgiveness* Here!! 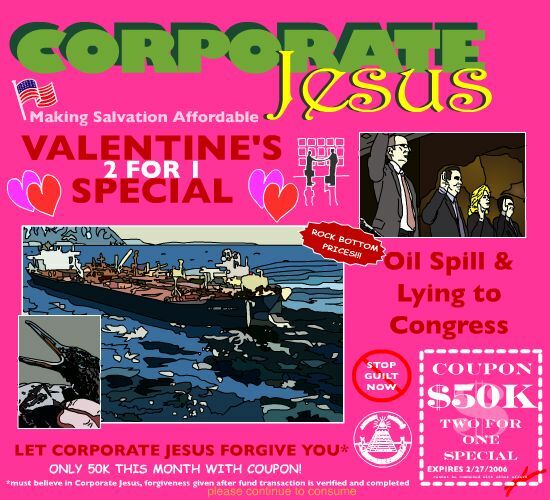 * - Forgiveness currently only for Corporations. Forgiveness for individuals coming soon.